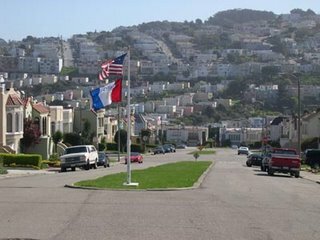 St. Mary's Park is a beautiful little neighborhood located in the South-west corner of Bernal Heights, in San Francisco. The St. Mary's Park Improvement Club (SMPIC) is an organization dedicated to improving our neighborhood, its parks, landscaping, and sense of community. Welcome to St. Mary's Park! In 1850 the land that today is known as St. Mary's Park was rolling hills, pastures and tidal marshland. 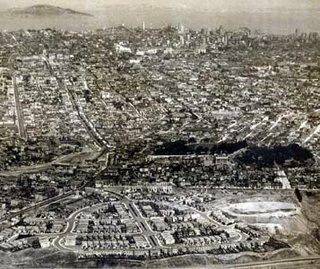 In 1855, Joseph Alemany, first archbishop of San Francisco, acquired a tract of land bounded by Hayes, Grove, Larkin and Polk streets for the site of a new college. However, the increased congestion in the rapidly expanding city forced Alemany to the "country" south of San Francisco, four miles from City Hall down Mission Road (then the country road to San Jose), where he bought 60 acres of Rancho Rincon de la Salinas y Potrero Viejo from Jesus Bernal for $1,600. On August 3, 1862, Alemany rode out to the new property and laid the cornerstone of St. Mary's College. The College opened in the fall of 1863 with 210 students. The "remote" location proved too cold and foggy for the faculty and students, so they packed up and moved to a seven-acre plot at Broadway and Webster in Oakland. Dedicated in 1889, this second home was a five-story structure affectionately called the "Brickpile." In 1894 a fire gutted it and the College returned to the San Francisco property while repairs were completed. 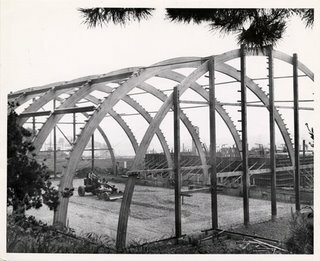 The College moved back to Oakland, and eventually relocated to its present 400-acre Moraga site in 1928. 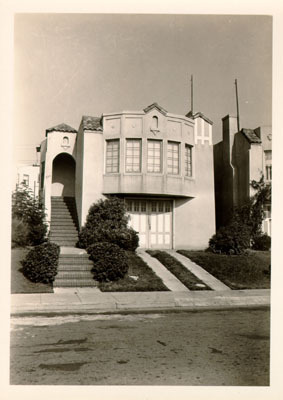 The San Francisco property languished until Archbishop Riordon, Alemany's successor, established St. John's Parish using the old college buildings. 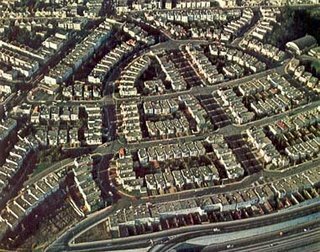 For a time the neighborhood was also used as a truck farm providing fruits and vegetables to the growing city. In 1924 Archbishop Riordon had the land surveyed and opened for subdivision. The neighborhood was laid out in the shape of a bell, and there are three streets in the park named for Brothers who taught at the College: Agnon Ave., Genebern Way and Justin Drive. On September 29, 1962, State Historical Marker #772 was placed on the St. Mary's Park Monument at College Ave. and Crescent Ave. The neighborhood of St. Mary's Park is fortunate to have a Recreation and Park facility in its midst. The Rec. Center itself was built in the 1930s as a project of the Works Progress Administration. There are many residents of the Park whose fathers helped build that facility. The Rec. Center houses a basketball gymnasium with bleachers, a weight room, an auditorium, offices, classrooms and a kitchen. The grounds include two baseball diamonds, a large grassy field often used for soccer, a children's playground, tennis courts, outdoor basketball courts and a dog park. The Rec. Center offers sports, classes and programs for tots, children, teens, adults and seniors. St. Mary's Park is a beautiful little neighborhood located in the South-west corner of Bernal Heights, in San Francisco. The St. Mary's Park Improvement Club (SMPIC) is an organization dedicated to improving our neighborhood, its parks, landscaping, and sense of community. 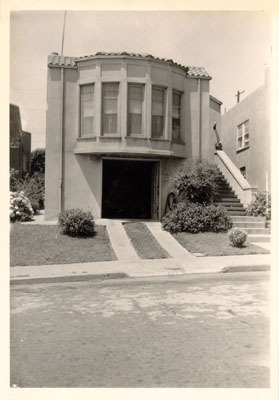 Founded in 1941, the club was initially a social vehicle for residents. Early meetings featured bingo, card games, square dances and raffles. While this social element is still vital, the club also places emphasis on neighborhood stewardship, acting as an advocacy group for issues that are of concern to residents. The St. Mary's Park Improvement Club meets at 7:30pm on the second Tuesday of each month. The SMPIC pays for the mowing and upkeep of the lawn-covered islands that bisect many of our neighborhood's streets. The club publishes The Park Bell newsletter on a monthly basis to help keep the neighborhood abreast of activities and issues of concern. It is delivered to each home in the neighborhood. The club's funds come from annual dues, advertisers in the Park Bell, donations, and the occasional fund-raiser. The club is led by an executive committee consisting of a president, vice president, treasurer, secretary, sergeant-at-arms, and Park Bell editor. As specified by the club's by-laws, these officers are elected each Fall and serve a one-year term that begins with the January meeting. St. Mary's Park is a neighborhood built on traditions that bring the community together.